The Nordic Council of Ministries (NCM) on a yearly basis supports cross border committees. 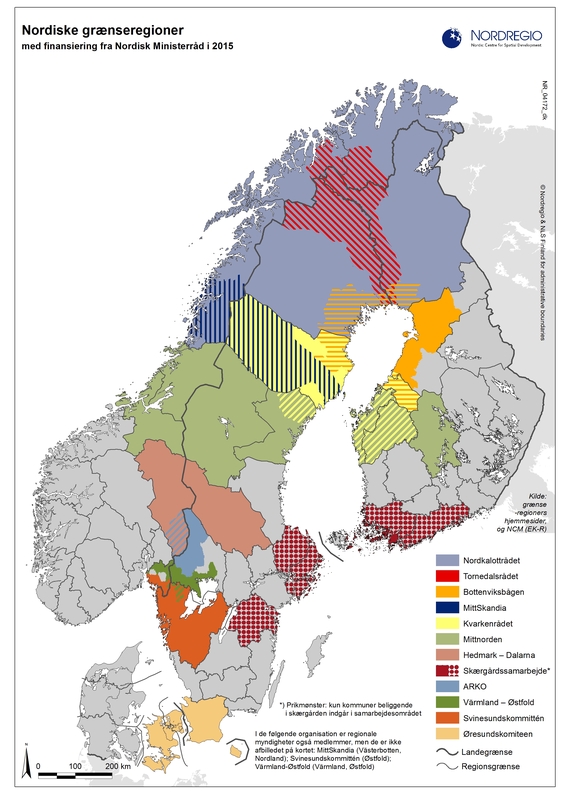 For 2015, ten Nordic cross-border committees received funding from the NCM, distributed through its’ Nordic Committee of Senior Ofﬁcials for Regional Policy (EK-R). The geographical extents of these ten cross-border regions are presented in the map. The cross-border regions are geographically delimited by their member institutions, which consist of government organisations on either regional or municipal level in neighbouring countries. These can be municipalities, counties, local authority associations or other organisations that deal with regional development. In some cases, the same regional body might be involved in several cross-border committees. Such areas are hatched in the map. The Nordic countries have a long history of cross-border co-operation. In parts, this co-operation has been carried out through regional cross-border committees which cooperate across the state borders. The activities of some of these committees have been going on since the 1960’s. The aim of the committees are increasing growth and development of the actual border region, building on the concept that bigger, dynamic and well-integrated regions will be able to retain and attract companies and people for further growth and development.